“Homestay homestay? 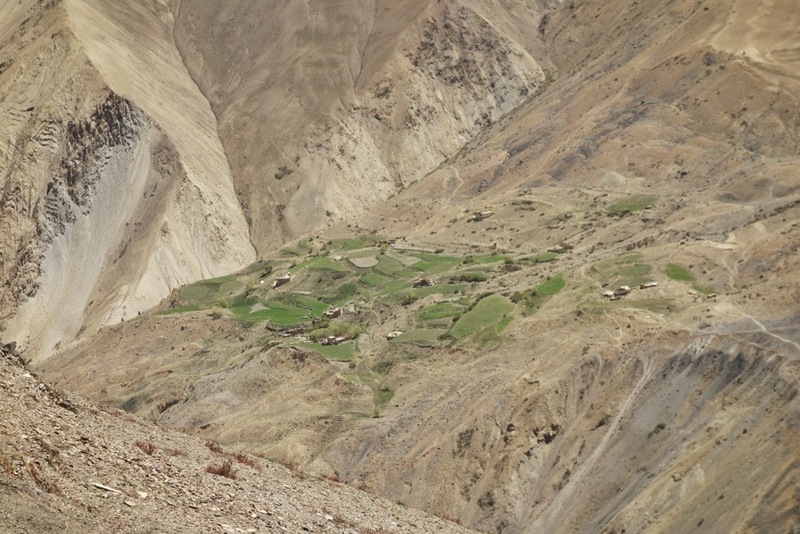 !” The Ladakhi man asked us as we passed through his small village, mostly green pastures with a few houses perched on the only flat ground in the region. We quickly realized that he didn’t know any English except that one important word, so we found another man in the village to translate prices (five dollars each for dinner, breakfast, a whole lot of tea, and a place to sleep) then followed him to his home. 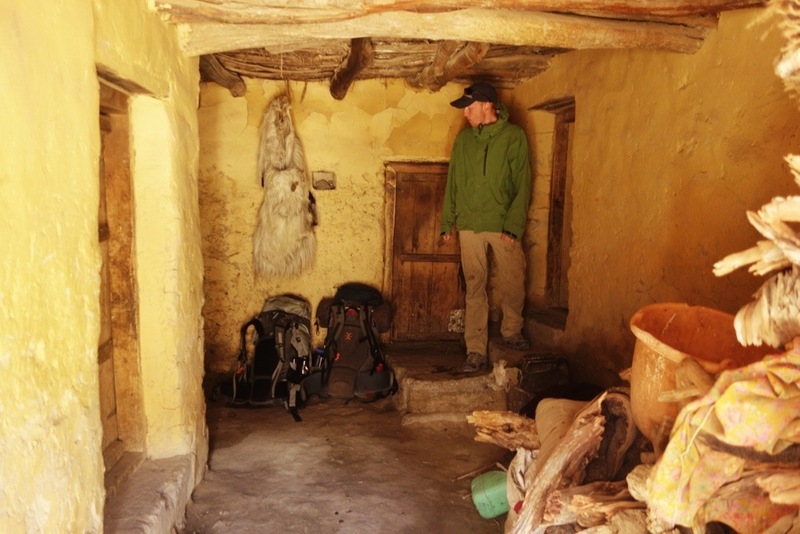 Though we have been staying in our tent and cooking for ourselves the last few nights, we were starting to run low on food and figured now would be a great time to try out this homestay arrangement that has become prevalent for trekkers throughout the region. Though I have done plenty of homestays in the past, this one would be different because for my first time I would be a paying guest. 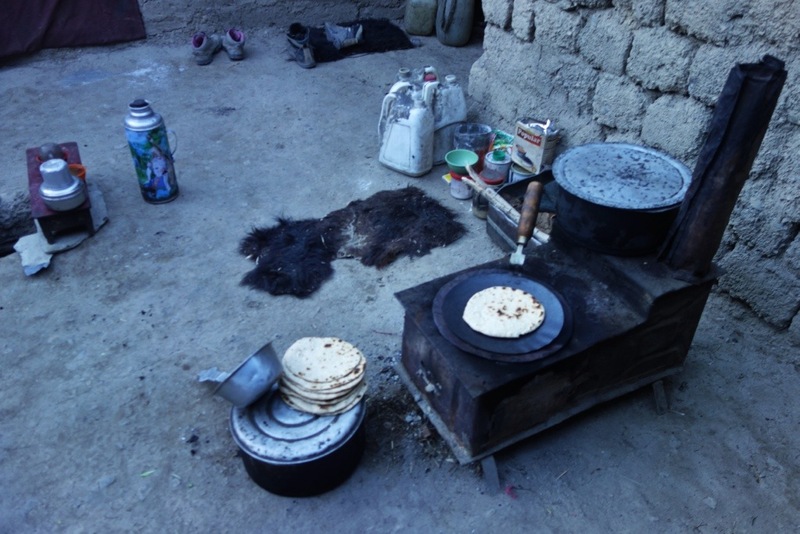 As there are no shops or places to buy food along the way, trekkers have taken to paying villagers for a meal and a space on their floor in order to get by. 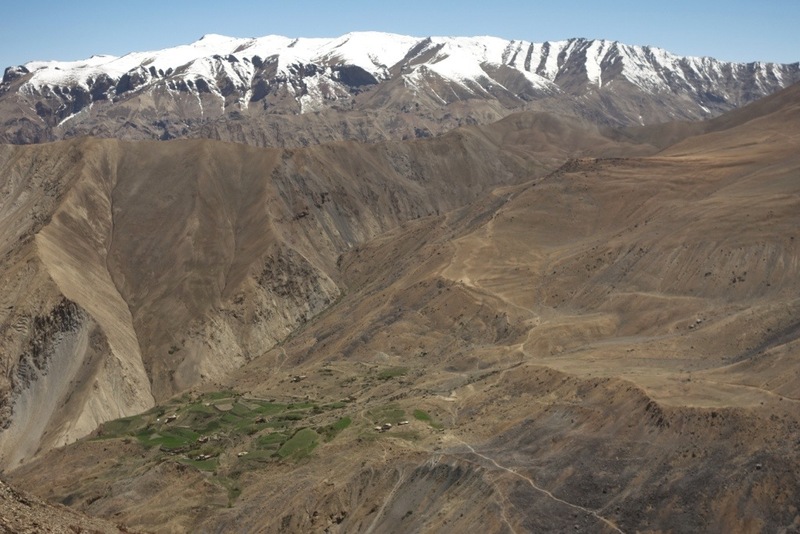 Here is the village from afar (the left side covered in green) as well as the trail to and from it. 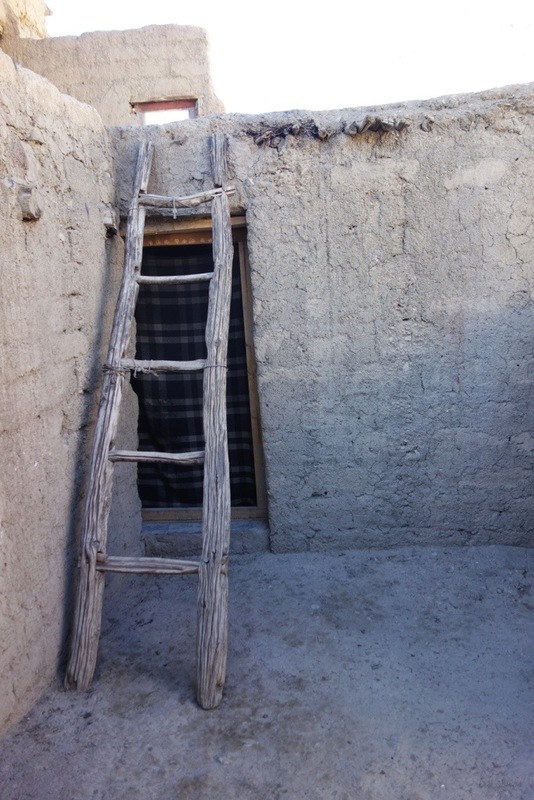 Here is his home, a traditional Ladakhi house made of mud and sticks (since there are no trees the sticks had to be brought in, probably on donkey or horseback, from days away). Though you can’t tell from the outside, the house is actually more like a courtyard with rooms around the edges (and a few upstairs, probably for storage). The animals also live below in a somewhat separated part. 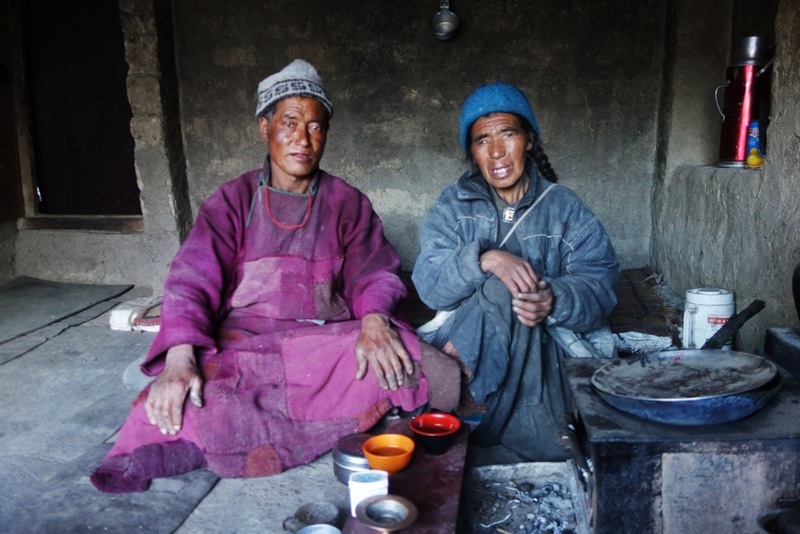 He had two stoves, one inside and one outside, which he fueled with yak dung. These stove came through in the 1960s and have been a blessing since the open fires they used before caused so much smoke damage both to their homes and to their lungs and eyes. 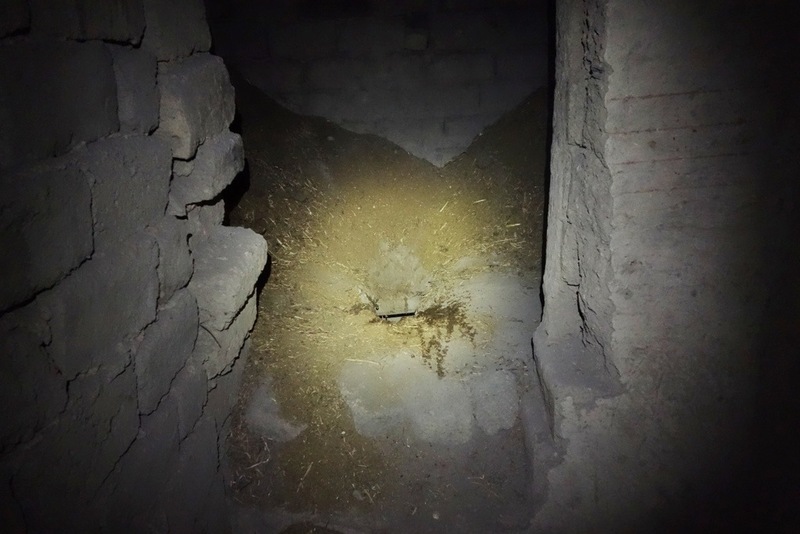 Here is the toilet, simply a hole in the ground where, after you go, you shovel down a bit of hay. They clean it out and then use it for fertilizer once it has dried. It doesn’t stink at all and feels a lot cleaner than most of the flushing toilets in the rest of India! 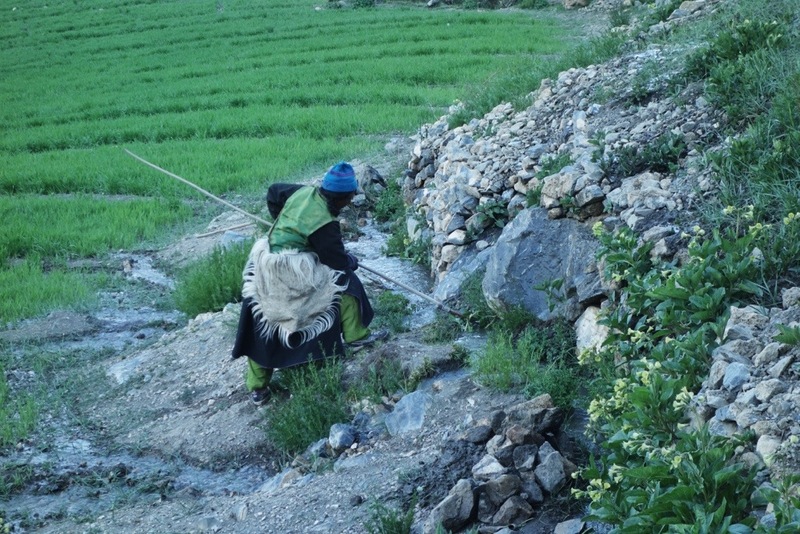 The man made us a whole thermos full of tea before running off to his fields (no easy feat considering it is at least half an hour up and down from the river… both ways) in order to fetch some greens for dinner. In the meanwhile I sat on the roof and watched the world around me: the older women working on the irrigation systems throughout the maze of fields, a young lady trying to catch a very cleaver escaped goat, and the donkeys grazing in the distance, calling out noisily to their friends across the way. The women in this region always wear animal fur (mountain goat hide if I’m not mistake) around their neck which hangs down to their bottoms. I think this enables them to sit on the ground (or snow) without getting wet or cold… But my guess is as good as yours! 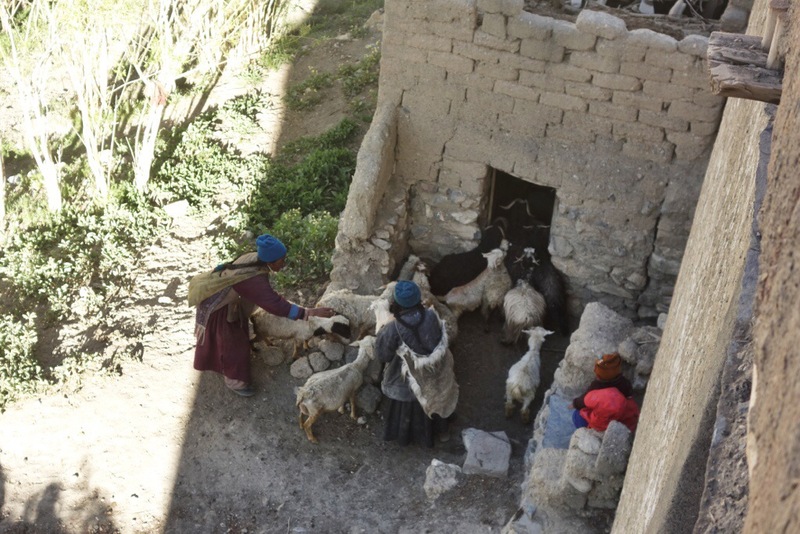 Here are a few women trying to herd their sheep and goats back into their house for the night. Every evening an amusing sorting process goes on throughout every village when the herder (a job that villagers switch off doing) brings the whole flock back from grazing. These animals, which the herder collected in the morning for every house, then need to be sorted back into their allotted homes. 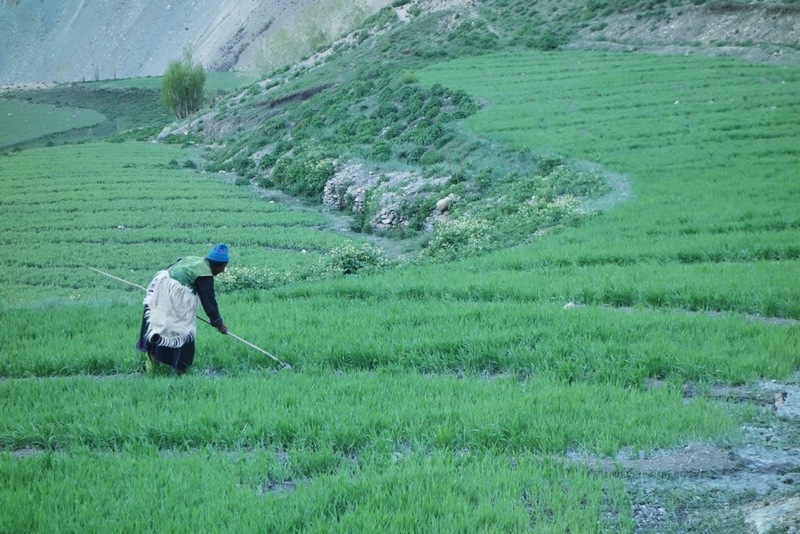 Often there are one or two who make a run for it and give the women a good work out as they race through the various fields (eating pants meant for the humans in the meanwhile). We ate rice and spinach with the man and his wife before falling asleep on the floor in the room they had shown us to for the night. 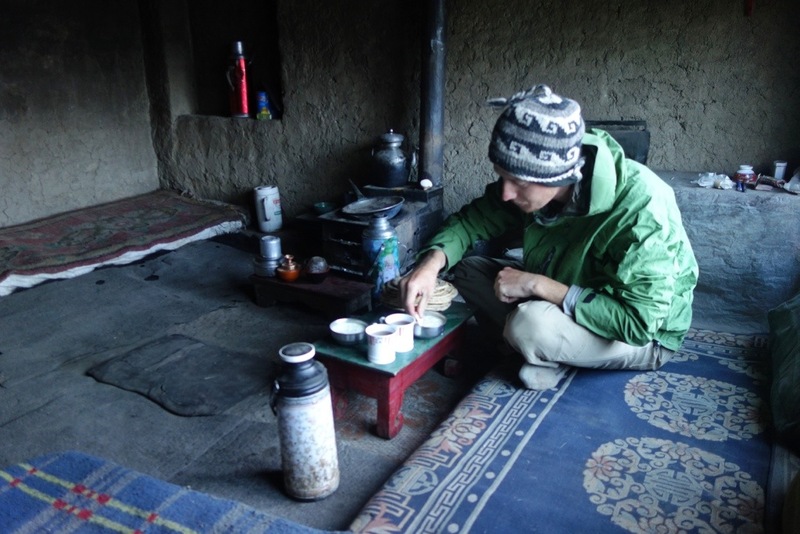 We ate chapati with curd (homemade yogurt that very sour) in the morning at six before heading off to continue the rest of our trek. 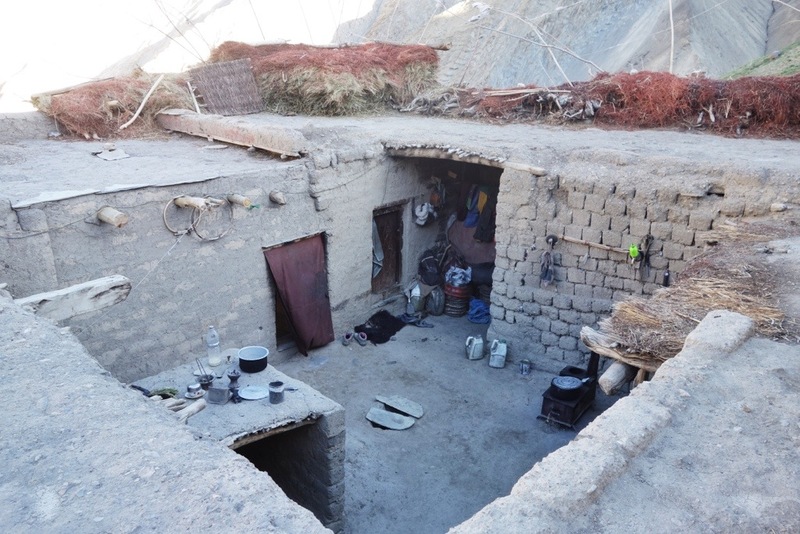 Though this region is very sparsely inhabited (you must walk at least a day if not two between each village which is typically composed of just a few homes), at each village someone always comes out to greet you and ask if you want a homestay. 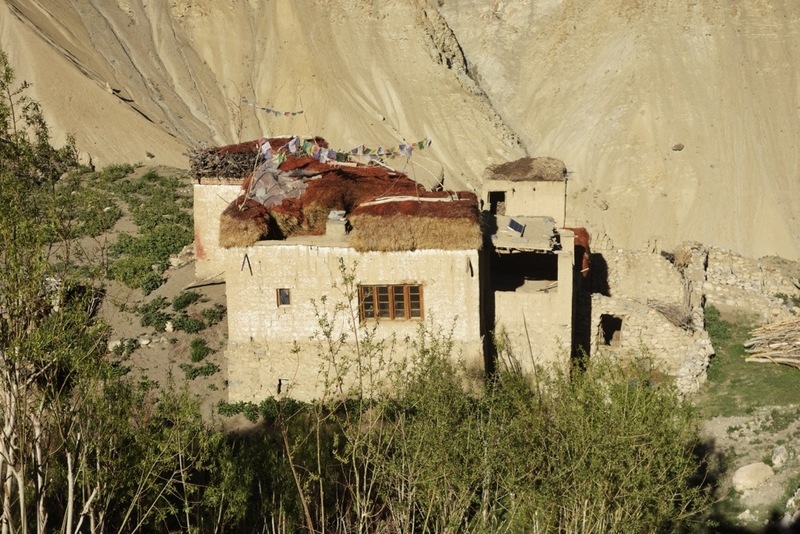 While these homestays bring money to this region of the world without any other source of income (as they are self sufficient farmers who are completely isolated in the winter and, until recently, have been days or even weeks away from any civilization even in the summer), it also provides us trekkers with a chance to see life in a setting so different from our own. I definitely prefer this to the tea houses in Nepal or guest houses in the rest of the country. 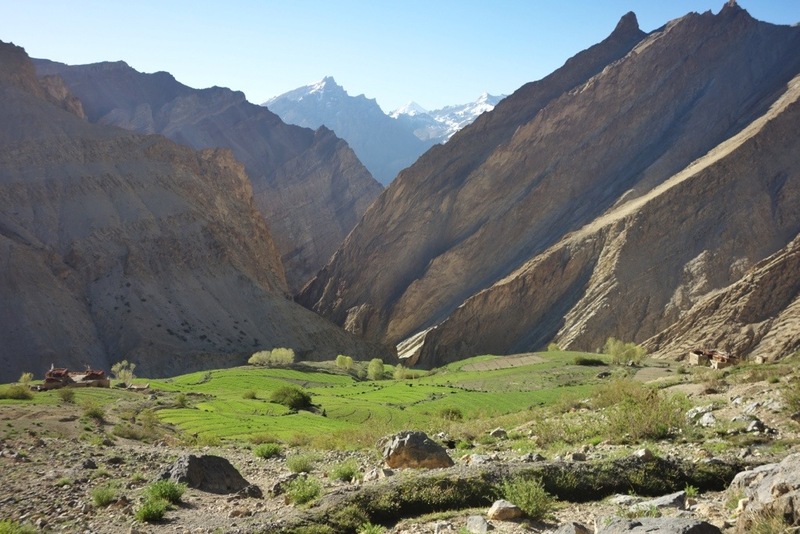 This entry was posted in India and tagged homestay ladakh, ladakh trek, lifestyle zanskar, trek padum, visit zanskar, zanskar homestay, zanskar trek by The Wandering Nomads. Bookmark the permalink. A very captivating experience reading this, I felt a sense of peace from the simplicity of the lifestyle lead by the people in the pictures. Thanks for bringing us along on the journey, very inspiring. Great! That’s exactly how I felt when I was there. Hey, I think that was I very wonderful experience you got. I wish, I visit this place once in life time.Thanking you for the pictures you uploaded. you are simply great.